MIX IT UP THIS CHRISTMAS! THROW BACK TASTY! GO RETRO! 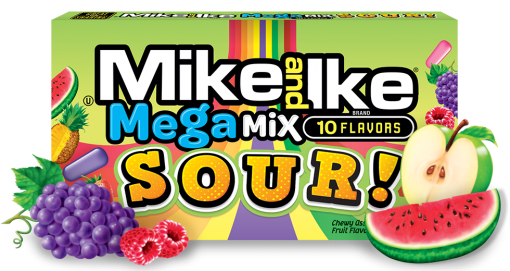 Take your taste buds to a whole new level with MEGA MIX SOUR! 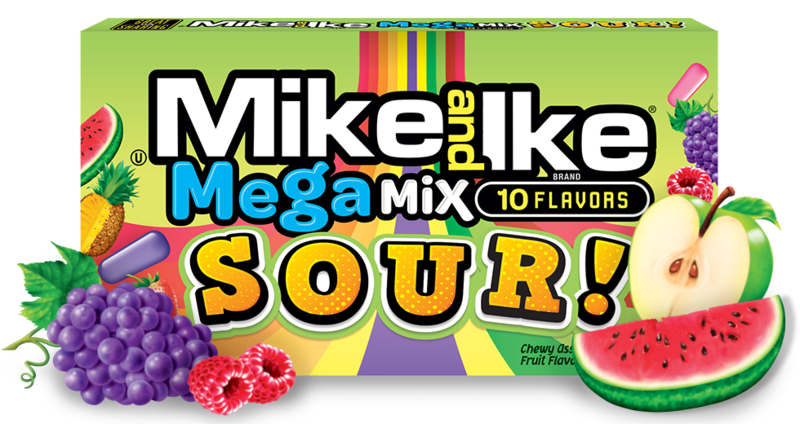 With 10 mouth-puckering, sour fruit flavored candies in one box, they are guaranteed to pack a powerful punch. SUGAR, CORN SYRUP, MODIFIED FOOD STARCH, FUMARIC ACID, SODIUM CITRATE, CONTAINS LESS THAN 0.5% OF THE FOLLOWING: CITRIC ACID, MALIC ACID, NATURAL AND ARTIFICIAL FLAVORS, DEXTRIN, CONFECTIONERS GLAZE, CARNAUBA WAX, MEDIUM CHAIN TRIGLYCERIDES, ARTIFICIAL COLOR, RED #40, YELLOW #5 (TARTRAZINE), YELLOW #6, BLUE #1. Our goal at Just Born, Inc. is to keep our online nutrition and ingredient information accurate and up to date. However, we recommend that you should always reference product labels or call 1-888-645-3453 for the most up to date nutrition and ingredient information. We are committed to producing products of the highest quality. To learn more about our responsibility to Quality, Transparency & our Heritage, please visit http://www.justborn.com/our-responsibility. 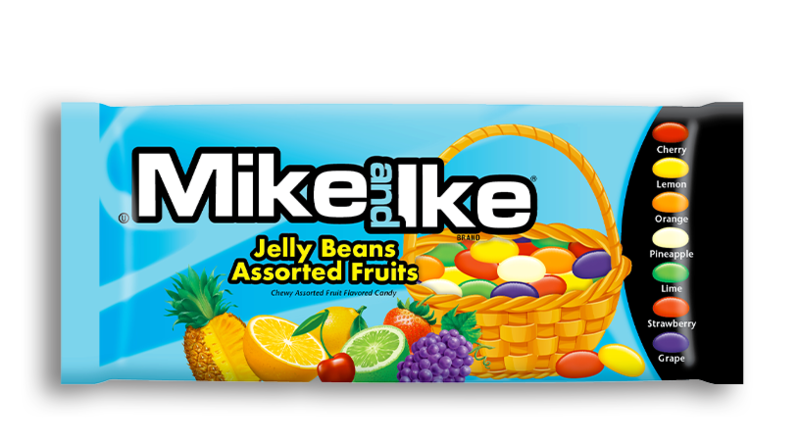 It’s just not Easter without the great taste of MIKE AND IKE® Jelly Beans – a colorful and FRUCHEWY®take on a classic candy, featuring cherry, orange, pineapple, grape, strawberry, lemon and lime flavored jelly beans. 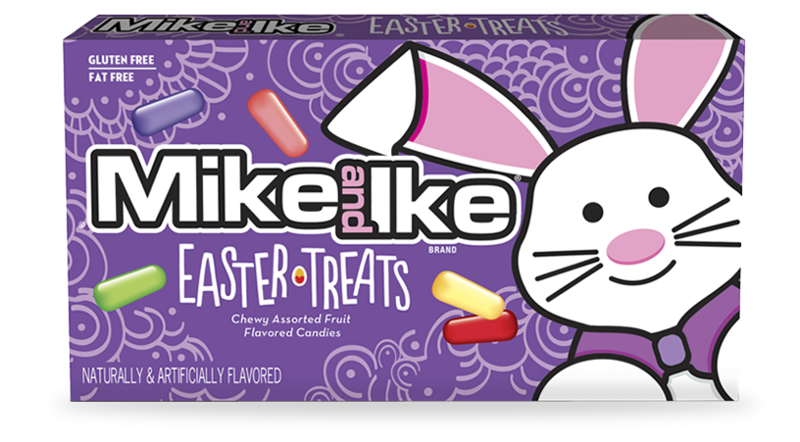 And, don’t forget to try MIKE AND IKE® Easter Treats too! SUGAR, CORN SYRUP, MODIFIED FOOD STARCH, CONTAINS LESS THAN 0.5% OF THE FOLLOWING: CITRIC ACID, MALIC ACID, FUMARIC ACID, SODIUM CITRATE, NATURAL AND ARTIFICIAL FLAVORS, DEXTRIN, CONFECTIONERS GLAZE, PECTIN, CARNAUBA WAX, MEDIUM CHAIN TRIGLYCERIDES, ARTIFICIAL COLOR, RED #40, YELLOW #5 (TARTRAZINE), YELLOW #6, BLUE #1, RED #3. 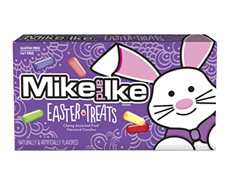 Hop to it and grab some sweet MIKE AND IKE® Easter Treats to share with your family and friends. 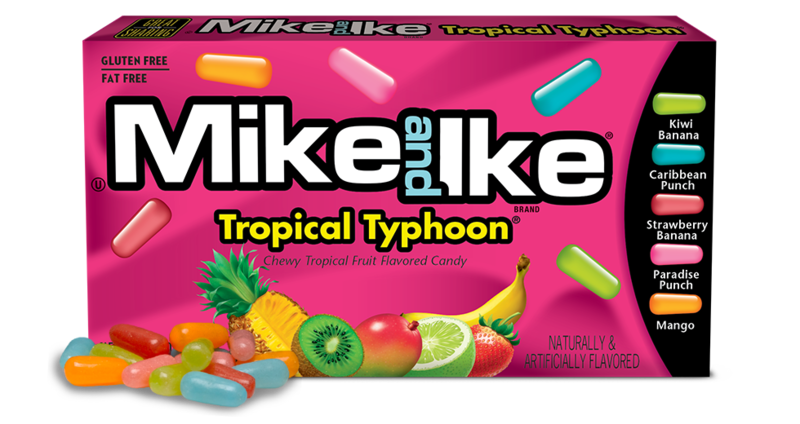 Each colorful box is filled with a variety of tasty flavors, including: grape, pineapple-banana, strawberry, lemon-lime and cherry. Get ‘em before they’re gone! 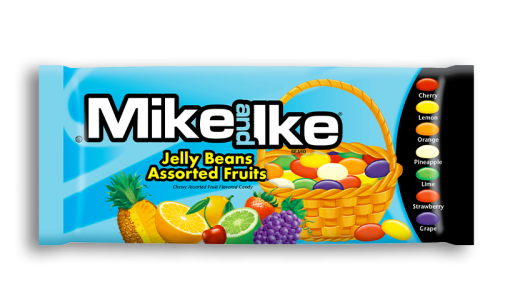 And, be sure to grab some MIKE AND IKE® Jelly Beans! SUGAR, CORN SYRUP, MODIFIED FOOD STARCH, CONTAINS LESS THAN 0.5% OF THE FOLLOWING: CITRIC ACID, MALIC ACID, FUMARIC ACID, NATURAL AND ARTIFICIAL FLAVORS, SODIUM CITRATE, DEXTRIN, ARTIFICIAL COLOR, CONFECTIONERS GLAZE, CARNAUBA WAX, MEDIUM CHAIN TRIGLYCERIDES, RED #40, YELLOW #5 (TARTRAZINE), BLUE #1. 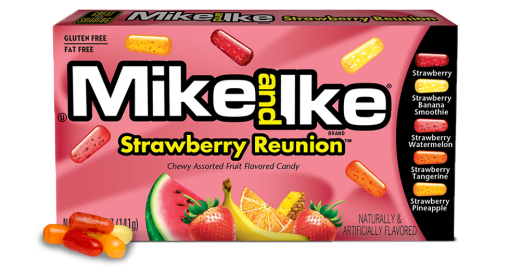 Experience the delightful sweetness of fruity chewy candy with MIKE AND IKE® Original Fruits, bursting with five FRUCHEWY® flavors including Cherry, Lemon, Lime, Orange and Strawberry. 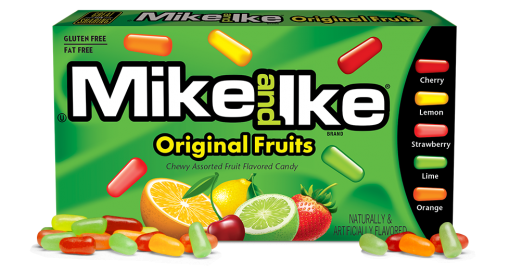 MIKE AND IKE® Original Fruits have been loved by kids and adults alike for over 75 years! SUGAR, CORN SYRUP, MODIFIED FOOD STARCH, CONTAINS LESS THAN 0.5% OF THE FOLLOWING: CITRIC ACID, MALIC ACID, FUMARIC ACID, SODIUM CITRATE, NATURAL AND ARTIFICIAL FLAVORS, DEXTRIN, CONFECTIONERS GLAZE, CARNAUBA WAX, MEDIUM CHAIN TRIGLYCERIDES, RED #40, YELLOW #6, YELLOW #5 (TARTRAZINE), BLUE #1. 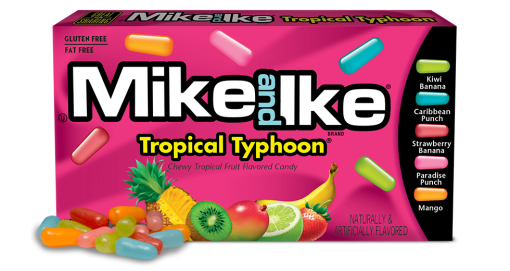 MIKE AND IKE® TROPICAL TYPHOON® is jam-packed with five tropical FRUCHEWY® flavored candies to send your taste buds twirling! Enjoy mouth-watering flavors including Paradise Punch, Kiwi-Banana, Caribbean Punch, Strawberry-Banana and Mango! SUGAR, CORN SYRUP, MODIFIED FOOD STARCH, CONTAINS LESS THAN 0.5% OF THE FOLLOWING: CITRIC ACID, MALIC ACID, FUMARIC ACID, SODIUM CITRATE, NATURAL AND ARTIFICIAL FLAVORS, DEXTRIN, ARTIFICIAL COLOR, CONFECTIONERS GLAZE, CARNAUBA WAX, MEDIUM CHAIN TRIGLYCERIDES, RED #40, YELLOW #5 (TARTRAZINE), YELLOW #6, BLUE #1. 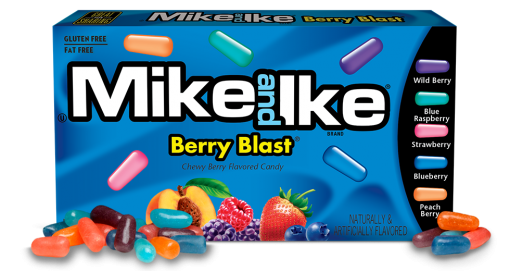 We know you love mixed berry flavors, and MIKE AND IKE® BERRY BLAST® delivers with five mouth-watering flavors including Wild Berry, Blue Raspberry, Strawberry, Blueberry and Peach Berry. SUGAR, CORN SYRUP, MODIFIED FOOD STARCH, CONTAINS LESS THAN 0.5% OF THE FOLLOWING: CITRIC ACID, MALIC ACID, FUMARIC ACID, SODIUM CITRATE, NATURAL AND ARTIFICIAL FLAVORS, DEXTRIN, CONFECTIONERS GLAZE, CARNAUBA WAX, MEDIUM CHAIN TRIGLYCERIDES, RED #40, BLUE #1, YELLOW #5 (TARTRAZINE). The Flavor that brought Mike and Ike back together! 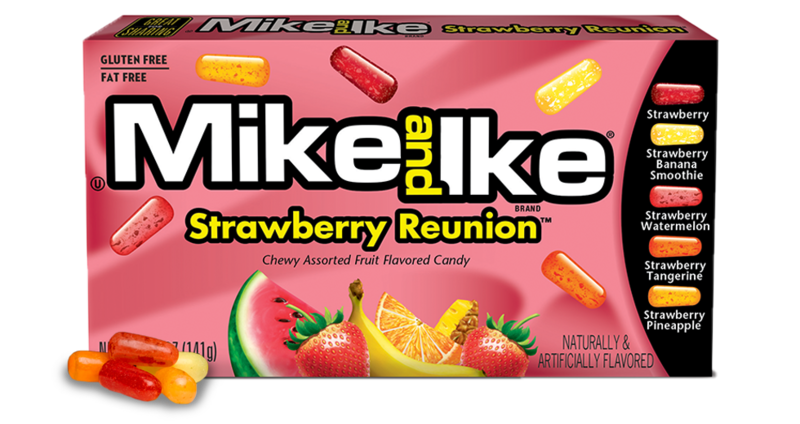 Inspired by Ike's artwork and Mike's music, this variety is all about strawberry. Strawberry blended flavors include: Strawberry, Strawberry Banana Smoothie, Strawberry Watermelon, Strawberry Tangerine and Strawberry Pineapple. SUGAR, CORN SYRUP, MODIFIED FOOD STARCH, CONTAINS LESS THAN 0.5% OF THE FOLLOWING: CITRIC ACID, MALIC ACID, FUMARIC ACID, SODIUM CITRATE, NATURAL AND ARTIFICIAL FLAVORS, DEXTRIN, CONFECTIONERS GLAZE, CARNAUBA WAX, MEDIUM CHAIN TRIGLYCERIDES, ARTIFICIAL COLOR, RED #40, YELLOW #5 (TARTRAZINE), YELLOW #6. Enjoy big FRUCHEWY® flavor packed in a tiny piece! 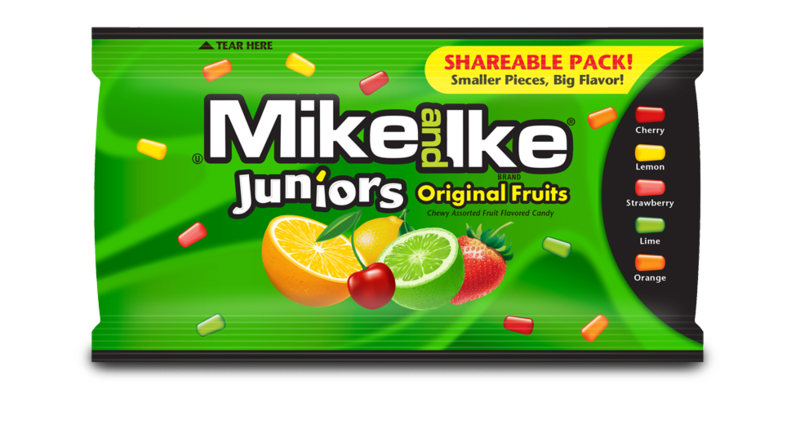 Tear open and share a pack of MIKE AND IKE® JUNIORS Original Fruits, featuring smaller-sized pieces of our great-tasting Original Fruits flavored candies with all of your favorites: Cherry, Lemon, Lime, Orange and Strawberry! SUGAR, CORN SYRUP, MODIFIED FOOD STARCH, CONTAINS LESS THAN 0.5% OF THE FOLLOWING: CITRIC ACID, MALIC ACID, FUMARIC ACID, SODIUM CITRATE, NATURAL AND ARTIFICIAL FLAVORS, DEXTRIN, CONFECTIONERS GLAZE, CARNAUBA WAX, MEDIUM CHAIN TRIGLYCERIDES, RED #40, YELLOW #5 (TARTRAZINE), YELLOW #6, BLUE #1. Everyone's favorite all-red fruit flavored MIKE AND IKE® candies in one box create an OUTRAGEOUS experience. 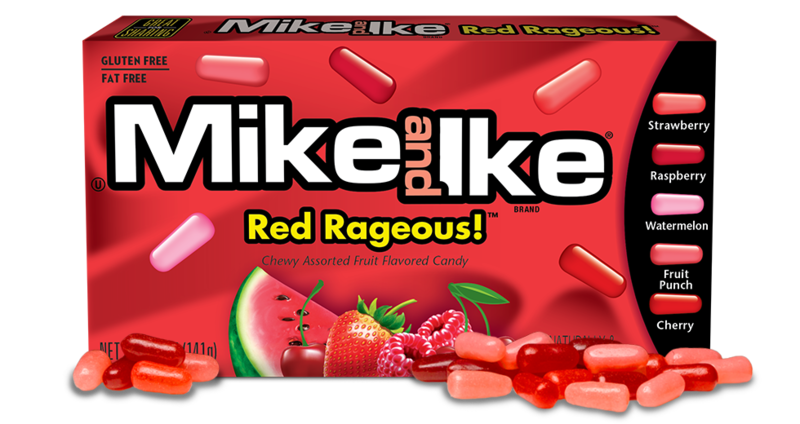 Try these mouth-watering flavors of RED RAGEOUS!™ today including Strawberry, Raspberry, Watermelon, Fruit Punch and Cherry. SUGAR, CORN SYRUP, MODIFIED FOOD STARCH, CONTAINS LESS THAN 0.5% OF THE FOLLOWING: CITRIC ACID, MALIC ACID, FUMARIC ACID, SODIUM CITRATE, NATURAL AND ARTIFICIAL FLAVORS, DEXTRIN, CONFECTIONERS GLAZE, CARNAUBA WAX, MEDIUM CHAIN TRIGLYCERIDES, RED #40, ARTIFICIAL COLOR, YELLOW #6. You want more flavors? You got it! Our Mega Mix is loaded with 10 delicious fruity, chewy flavors - Caribbean Punch, Strawberry-Banana, Paradise Punch, Grape Soda, Kiwi Banana, Mango Delight, Watermelon, Pineapple Banana, Peach Berry, and Blue Raspberry - all in ONE BOX. 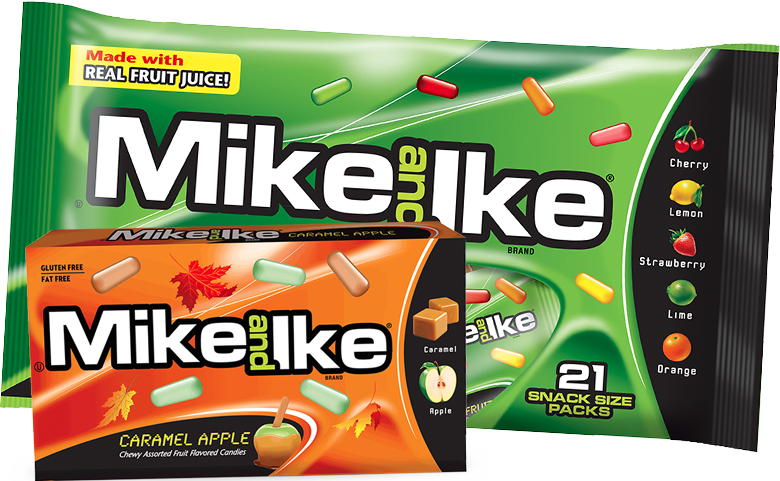 Enjoy them one at a time or mix 'em up to create your own flavor combination. SUGAR, CORN SYRUP, MODIFIED FOOD STARCH, CONTAINS LESS THAN 0.5% OF THE FOLLOWING: FUMARIC ACID, NATURAL AND ARTIFICIAL FLAVORS, SODIUM CITRATE, DEXTRIN, CITRIC ACID, MALIC ACID, CONFECTIONERS GLAZE, ARTIFICIAL COLOR, CARNAUBA WAX, MEDIUM CHAIN TRIGLYCERIDES, YELLOW #5 (TARTRAZINE), RED #40, BLUE #1, YELLOW #6. 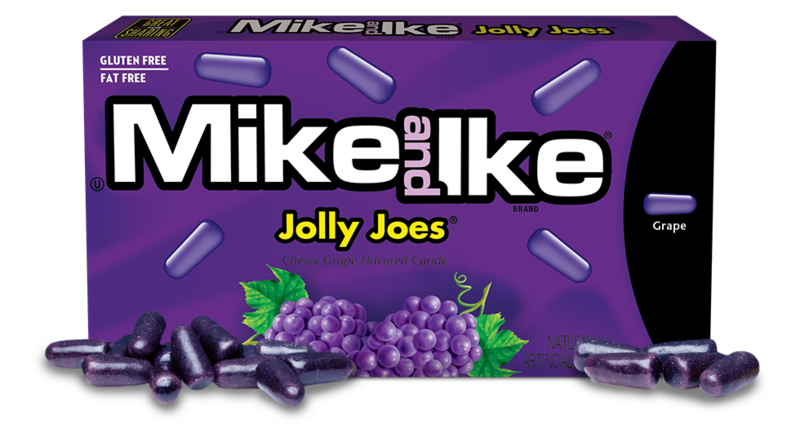 If it's all GRAPE that you're looking for, then reach for MIKE AND IKE® JOLLY JOES®! 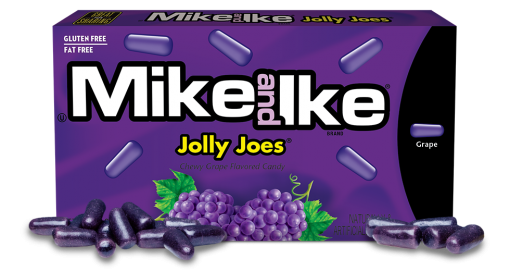 There's so much grape flavor packed into each JOLLY JOES® candy - get some today! 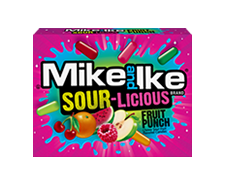 SUGAR, CORN SYRUP, MODIFIED FOOD STARCH, CONTAINS LESS THAN 0.5% OF THE FOLLOWING: CITRIC ACID, MALIC ACID, FUMARIC ACID, SODIUM CITRATE, DEXTRIN, NATURAL AND ARTIFICIAL FLAVOR, CONFECTIONERS GLAZE, CARNAUBA WAX, MEDIUM CHAIN TRIGLYCERIDES, RED #40, BLUE #1. 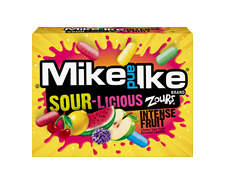 Enjoy the sweetness of Fruit Punch with a kick of sour with MIKE AND IKE® SOUR-LICOUS Fruit Punch flavored candies! 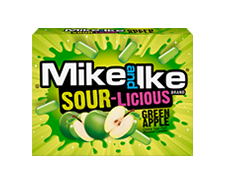 Including five mouth-watering flavors including Sour Raspberry, Sour Green Apple, Sour Citrus, Sour Cherry, and Sour Watermelon flavors. SUGAR, CORN SYRUP, MODIFIED FOOD STARCH, FUMARIC ACID, CONTAINS LESS THAN 0.5% OF THE FOLLOWING: SODIUM CITRATE, NATURAL AND ARTIFICIAL FLAVORS, DEXTRIN, CONFECTIONERS GLAZE, CARNAUBA WAX, MEDIUM CHAIN TRIGLYCERIDES, RED #40, ARTIFICIAL COLOR, YELLOW #5 (TARTRAZINE), YELLOW #6, BLUE #1. 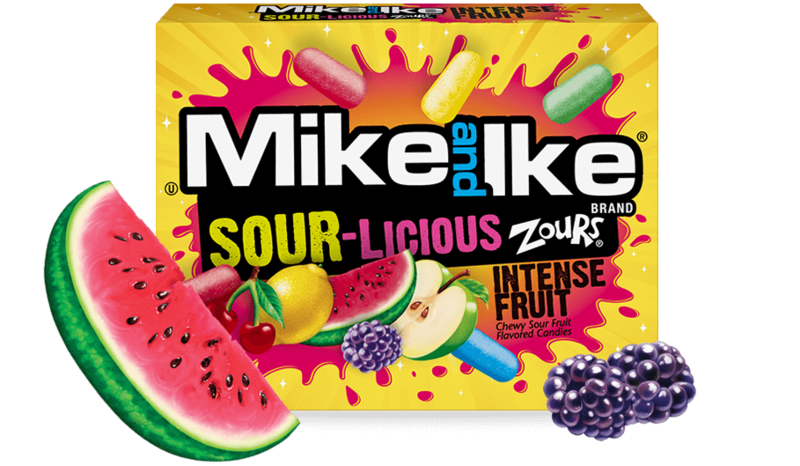 MIKE AND IKE® SOUR-LICIOUS ZOURS® Intense Fruit flavored candy is the classic variety of ZOURS® you know and love! 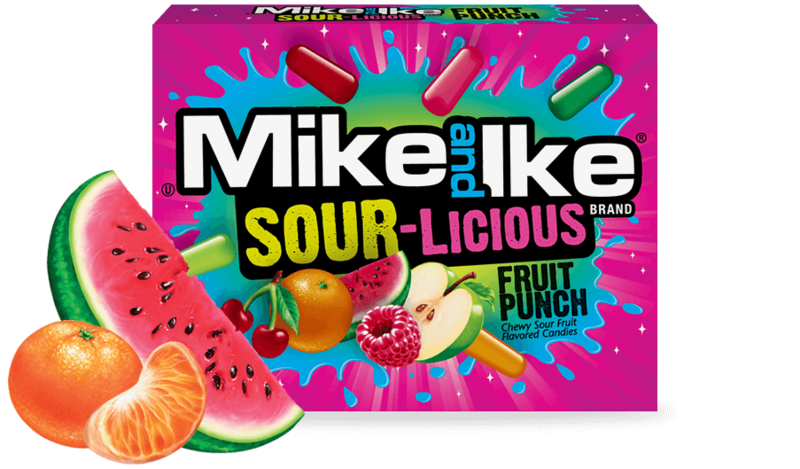 With sour watermelon, sour cherry, sour lemon, sour apple and sour blue raspberry flavors that deliver delightful sweetness with just the right amount of zing! SUGAR, CORN SYRUP, MODIFIED FOOD STARCH, FUMARIC ACID, GUM ARABIC, CONTAINS LESS THAN 0.5% OF THE FOLLOWING: SODIUM CITRATE, NATURAL AND ARTIFICIAL FLAVORS, DEXTRIN, ARTIFICIAL COLOR, YELLOW #5 (TARTRAZINE), BLUE #1, BLUE #1 LAKE, RED #40, YELLOW #6. 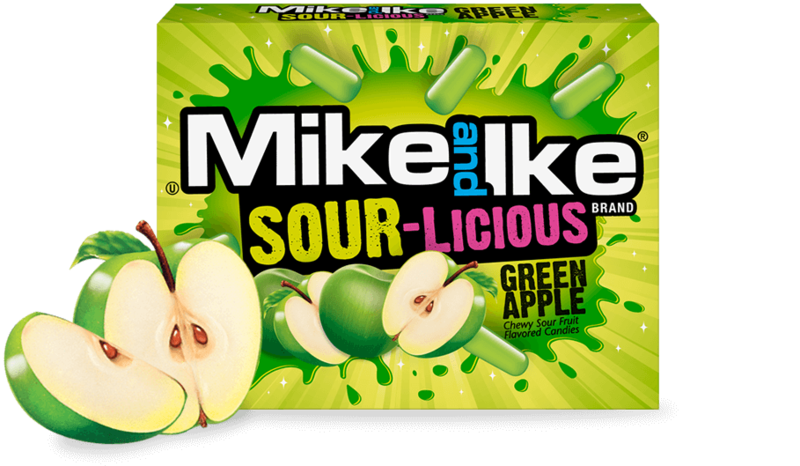 Enjoy the tangy taste of green apples exploding in every bite of MIKE AND IKE® SOUR-LICIOUS Green Apple flavored candy! SUGAR, CORN SYRUP, MODIFIED FOOD STARCH, FUMARIC ACID, CONTAINS LESS THAN 0.5% OF THE FOLLOWING: SODIUM CITRATE, NATURAL AND ARTIFICIAL FLAVORS, DEXTRIN, CONFECTIONERS GLAZE, CARNAUBA WAX, MEDIUM CHAIN TRIGLYCERIDES, ARTIFICIAL COLOR, YELLOW #5 (TARTRAZINE), BLUE #1. 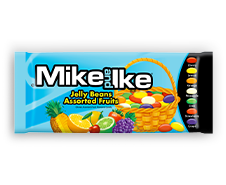 Experience the sweet taste of fruity chewy candy with MIKE AND IKE® Original Fruits, bursting with five fun flavors, including: Cherry, Lemon, Lime, Orange, and Strawberry. 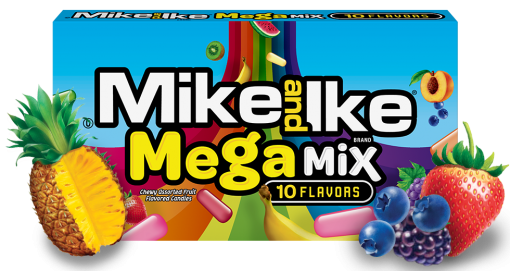 It's fruity, it's chewy, it's FRUCHEWY!® Or try our other assorted varieties of MIKE AND IKE® including TROPICAL TYPHOON®, BERRY BLAST®, Mega Mix, and many more. Sign up today to receive product updates, special offers and more!